Ellie Flaherty is a young woman living in a small town in Ireland who, after a series of small inconveniences, has just married her childhood sweetheart, John. But when John is seriously injured fighting in the Irish resistance against England, his injuries force Ellie to take some drastic measures. Due to their financial insolvency, there's no money for the operation that John needs to fully recover. Soon Ellie finds herself on a ship to America to begin working as a ladies' maid, with plans to send her pay home to John for his needs. But America is nothing like what Ellie had been expecting, and soon she's caught up in its siren song. Leapfrogging out of her job as a maid and on to bigger and better things, Ellie reinvents herself as a young cosmopolitan woman about the city and finds the freedom and elegance she never had in Ireland. Years pass when an unexpected event threatens to send her home to her life back on the farm, but Ellie isn't sure she's ready to leave behind the land of opportunity for a small backwater, despite the fact that she loves John deeply. In this country mouse/city mouse tale, Kate Kerrigan shares the story of a woman whose loyalties and heart are torn in two opposing directions, and the choices she must make to finally bring everything together. Having recently read Brooklyn by Colm Toibin, I was eager to read another Irish immigrant story to see how the two tales were similar and how they differed. Generally, I enjoy these types of stories and find that I always learn a lot about history when I indulge myself with one of them. One of the key differences in this story from Brooklyn was its historical focus on the struggles Ireland had with England to win the freedom of their country. Though the plot wasn’t totally centered around this conflict, there were a few pertinent pieces that hinged on this plot element, and through John’s injury, Ellie gains the impetus to travel to America, where the bulk of this story really takes place. Ellie was a wonderful character, and very human. Though she wasn’t overly selfish, she was pragmatic about how much easier life was for her in America. She was sensitive to her family back home and knew that they also would fare better in America, but she never became pushy and overbearing with them. Ellie also had the kind of attitude that lent itself to the enjoyment of her new surroundings without ever becoming frivolous. The crux of her conundrum came when she discovered that she simply could not lead two very different lives, and that the life she wanted for herself might not be the life she had to settle for. This was a very hard choice for her to make, and her reactions and behavior upon making it were not only realistic, but potent. Though Ellie found a way to navigate America and make her situation work for her, in reality, her heart was at odds with itself over her separation from John. The situation was even more complex because Ellie and John had been in love since their childhood, and John’s absence left a huge hole in Ellie’s life. Ellie’s time in America was drawn with large strokes, and instead of minute detail, there was more of an overall encompassing of the large period of time she spent away from Ireland. I particularly enjoyed her first few American discoveries, such as indoor plumbing, telephones and electricity. What was interesting is that Kerrigan never seemed to mention that life in Ireland lacked all of these benefit but instead filled in that gap by showing Ellie’s first reactions to these strange accouterments of life in the States. Her gradual immersion into an American lifestyle changed her in ways that made it hard for her to ever be that humble girl that left the farm, but it didn’t taint her in ways that made it impossible for her to ever return. Most of the time I was reading, it was like looking through the eyes of a foreign stranger who was constantly surprised and delighted by the things that most Americans take for granted. I must say a lot of this book surprised me, because it’s not your typical immigrant tale. Sometimes I find that these stories have set patterns that they never stray away from. This tale wasn’t like that. People didn’t do the things that you expected them to do, and many of the issues were not handled in the way I had expected them to be. I enjoyed this because it made for a rather unpredictable and organic feeling story that intrigued me. Though I had been expecting the last third of the book to unravel in a very orderly and predictable way, Kerrigan mixed it up for her readers and gave them something other than the usual to chew on. From top to tail it was a bittersweet story, and it was such a pleasant read that I had a hard time putting it down. Though there are other books out there that are similar to this one, I believe that Kerrigan’s offering is a cut above due to the advanced character creation and narrative. Each section of this story seemed to build upon the last, creating a brilliant melange of a tale that readers who enjoy immigrant stories will love. It was a gentle tale, told with style, and I found that as I turned the last page, I wished I could continue on the journey with Ellie. I’m hopeful that the next time Kate Kerrigan plys her pen, she creates a heroine as delicious as Ellie Flaherty. 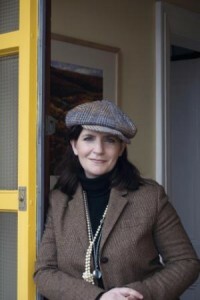 Kate Kerrigan is the author of two previous novels in the United Kingdom. She lives in Ireland with her husband and their two sons. Visit Kate’s website at www.katekerrigan.ie and follow her on Twitter: @katekerrigan. I love books that you hate to leave after you turn the last page! Thanks for the lovely review, as always! I really love the sound of this book! Fantastic review. I'll be back to read this one in more depth because I've got it coming up next week. After seeing you enjoyed it, I'm really looking forward to it. Lovely review. This sounds both very intriguing and original. I am very curious about what choices she made. It's really too bad that most immigrant novels don't deviate from the same pattern, because in reality there actually isn't a "typical" immigrant tales - just as many experiences as there are people. So I'm really glad to hear that this book is an exception to that trend. This does sound like a cut above on the subject. I just read an interesting author interview as well. This goes on my list. This sounds like the perfect book for me. After our recent trip to Northern Ireland, I've become fascinated with the Partition of Ireland and, as you know, I love a good immigrant story. Great review, really made me want to read it! Adding it to my TBR list. Thanks. I've been seeing this book around but your is the first review I'm reading. I'm fascinated by immigrant stories as well, and this one sounds perfect both for that element and for being different. I will add this one to my list. Execellent review, Zibilee, which makes me want to read this book. Ellie does sound like a wonderful and realistic character. I love immigrant stories! I enjoyed Brooklyn, although I wanted to scream at the ending. I'm sure I would like this one too. Very nice review. I hope to have a chance to read this book soon. I'm glad to hear you didn't find it predictable. Sounds like a good addition to my TBR pile. So glad to hear that this book seems to be a bit different from the usual immigrant tale. Very interesting concept! Great review! Would really love to read this story. I have some Irish immigrant in my family history. This story sounds very well written. Please enter me in this giveaway. This sounds like a keeper...very well done. Thanks for the great review, as always. A lovely book, I think, as from your review. Glad to hear that this immigrant tale breaks out of the standard mold! Sounds like a must read for me, especially since my Gram came here from Ireland herself. Great review! I was so excited to read this but haven't gotten to it yet unfortunately. I haven't read Brooklyn yet either though I really want to so good to hear they're different. Sounds like a character I will really like! what a marvelous review! i do love immigrant tales - especially those involving the irish so i'm going to have to add this to my list....your review reminds me of another author for some reason - have you ever read any of Elizabeth Musser's books? very gentle yet with a heroine that you just cannot leave. I just learned that I made a mistake not agreeing to review this book but at least I can still read it. I don't know why, but at the time I read the book summary it put me off. I don't remember why. Weird. But I love the story possibly because Ellie sounds like a terrific character and a woman whose story I want to hear. I keeping thinking about Ellie leavin Ireland and John to g to America to earn money for him. She must have been terrified...it's such a huge sacrifice! She was probably a little excited, too. It certainly sounds as if she and the city take to each other! I wonder if something like what happened to Ellie and John happened to couples all those years ago? I suppose it did. And today Spouses complain when their spouses work overtimne 5 nights a week! I loved your review, Heather, it's fantastic. Thank you for changing my mind about a terrific, worthwhile read! Wow Heather - thanks for the amazing review. Means so much to me that you liked the book - especially as I sit here in my house by the sea in ireland knowing that all you great americans are over there enjoying Ellie's journey! Just finished City of Hope, the sequel - and will be over in L.A. and NYC in Sept/Oct for a few days. Might get to meet a few of you guys then? Lets stay in touch and thank you so, so, much again. I must have this book, it really sounds wonderful. I love a book you ca learn a little from. This is being added to my TBR list! Bumping it up to! I love books based on Irish history, characters etc, and I need more books to help me finish an Irish reading challenge. The book sounds fantastic, thanks for the review! PS - You some how disappeared of my feeds, so I had to re find you!